The pose copier contains many buttons and other information to facilitate the insertion of poses in the animation. Preview Window Based on master template's generated thumbnails, previews currently selected frames. Load Selected Template Updates the template with the newly selected template. Name of the currently selected template. Vertical Slider (SLV) Linked to the slv- node of the node system. Horizontal Slider 1 (SLH) Linked to the slh- node of the node system. 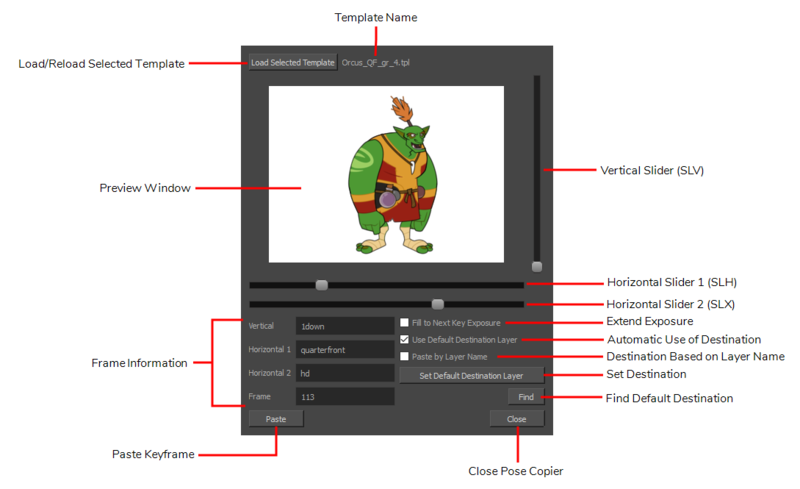 Default slider for the pose copier if no guide layers are created. Horizontal Slider 2 (SLX) Linked to the slx- node of the node system. Having this option checked will automatically extend the exposure of the pasted frame up to the next key. Use Default Destination Module When enabled, the pasted keys will automatically refer to the destination defined in the option Set Default Destination Module. When this option is checked the pasted layers will look for the individual layer name instead of matching the hierarchy of the template. For more information on the different pasting options, see Pasting Poses Using the Pose Copier . Set Default Destination Module Instead of selecting the destination every time, the layer set as default destination will automatically paste the keys onto those layers. Find This will center on the default destination in the timeline. Paste Paste the current position of the pose copier onto the destination. Frame Frame number of the selected frame within the master template.